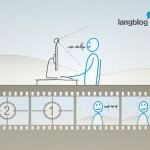 Langblog is another of the online free tools developed by Speakapps to promote oral production among language students. In this case, it allows to easily record audio and video blog posts that automatically are available online to be commented either by the teacher or by fellow classmates. You can find more information about how Langblog works in the short video below.